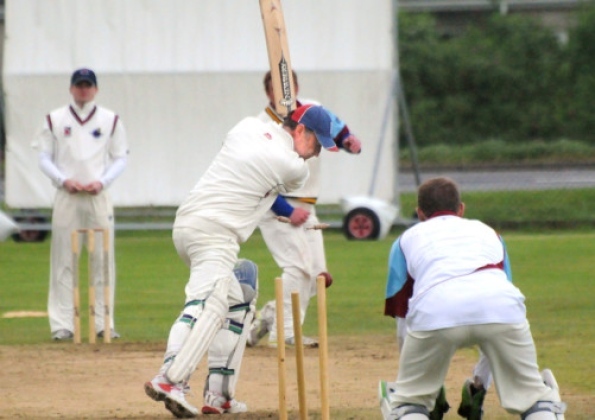 On a dry and fast St Boswells pitch, cut especially for Twenty20, Selkirk took to the field to play a team known in recent years for making unassailable scores against any weak bowling. Selkirk sensibly put their strike bowlers Greg Fenton and Jordan Reid in to restrict St Boswells’ scoring rate. Boswells’ opener Craig Paterson was out cheaply, replaced by Stephen Broom who pushed the rate up until his stumps were splayed by Rory Banks. Scott Hunter continued, to partner Elliot Ruthven and between them took the score to 60, until Ruthven was caught to a skier, soon after to be followed by Hunter, bowled by Ford. Aussie Mark Williams stayed solid at the crease as he accumulated 30 runs, while at the other end four St Boswells wickets tumbled in the space of 21 runs. With the score at a very attainable 97, Keith Farnish came out to partner Williams, who between them took 16 off the last 2 overs to leave a more respectable score of 113. In return, Selkirk started brightly, to match the sun slanting across The Green, and the loss of Everitt with a smart catch by ‘keeper Hunter off the bowling of Rory Elms didn’t slow the tempo. Fenton and Banks took the score to 50 in just under 7 overs, partly due to some less than ideal St Boswells fielding, before Fenton was bowled by Kathryn White. Graham, with Banks, took the score onto 68 before being bowled by the off-spin of Williams; and from there the ground seemed to open up for Selkirk. A deep catch by Paterson removed Banks for 33 to White, while at the other end Williams took 4 wickets in 2 overs to give him his first 5-fer at St Boswells (drinks all round!) Jordan Broom and Elliot Ruthven took the remaining two wickets to leave Selkirk 15 short of the total and St Boswells clear winners in what was a good-humoured and enjoyable match. Rain from a dishrag-grey sky speckled the windscreen of the minibus, as a much depleted St Boswells 1st XI took the long journey to the East Neuk of Fife to play Largo 1sts. This was expected to be a tough match, especially given St Boswells’ disappointing recent form. With both captains missing, along with a number of other first picks, St Boswells nevertheless took one look at the short boundaries of Upper Largo and made plans for some big-hitting, opting to bat first as the rain dried up. Regular opener Elliot Ruthven partnered veteran Thomas Goodman, making steady progress with decent Largo bowling, until Goodman fell for 15 to a low scorcher from Gillin. Acting captain Stephen Broom stepped up to the crease, and alongside Ruthven gradually moved the score to 60 in 17 overs. At this point it seemed as though 175 would be a respectable score. It was then that Broom started to find the middle of the bat. All this time the match was being watched by around 20 young bulls in the surrounding field who began to find company in the shape of Broom’s projectiles. In the space of 17 balls he hit six sixes – two of them particularly pleasurable following a claim of no boundary from a Largo fielder who had been laying across said line while holding the ball, part of a 26 run over off Largo’s Stevie Warrender. Broom finally fell for 80 in the 28th over to a big hit too many. Overseas player Mark Williams was due a big score, and took the part of the foil, while Ruthven made himself aggressor, passing 75, and then 100 in just 18 more balls. Williams then joined the run party as they both entertained the small crowd of people and the many more cattle with seemingly effortless scoring. By the time Ruthven was out for a magnificent 138, three balls had been lost to the scrubland, and Williams was still winding up. Just one more wicket fell, as St Boswells ended their 50 overs for 309 runs, Williams not out for 69. All this despite Largo bowling not one wide or no ball. Tea was taken in the nearby church hall, while outside the rain fell. Largo’s innings started in the dry, but that was all the good news the opposition would have, as Ruthven nearly broke the off-stump of Nicky Rintoul, followed by an outrageous combined stop (by 2nd slip Goodman) and catch (by 1st slip S Broom) off the same bowler – teamwork indeed. Andy Warrender and Alex Anderson steadied the Largo ship, which would seem to be needed as the rain began to fall at the 12 over mark, and how it fell! An hour of heavy drizzle came from over the Lomond Hills, darkening the day and causing not a little tension between the two teams: St Boswells who knew that bowling a few more overs would bring the Duckworth-Lewis calculator into play, and Largo who were keen to pack up for the day and not go down in the table. As it was, the rain eventually stopped, and there followed an astonishing spell of bowling from Stephen Broom and Barney Waugh, who managed to complete 12 overs in around half and hour before the black clouds, once again, closed in. The fact that these overs also put paid to four Largo batsmen for just 20 runs, including a brilliant run out by Jordan Broom, showed how important teamwork is in pressure situations. Largo conceded the game by Duckworth-Lewis(approximately 140 runs short), pushing St Boswells up the table, and making the bus journey home one to remember. And to cap it all, on Sunday 29th June, St Boswells won the 2014 Border Sixes tournament at Kelso, undefeated and barely troubled in any of the matches. Great performance guys! On the eve of the new season, the weather forecast that was meant to spoil the first weekend afforded St Boswells a reprieve when a pitch inspection carried out in bright sunlight gave the go ahead for the First XI East League Division 1 fixture against Largo. Winning the toss, Joint captains Craig McNeill and Kathryn White opted to bat first. Jamie Glover and Rich Young got stuck in straight away, with the later clattering 20 off one over before edging behind for 45, that brought big hitter Stephen Broom to the wicket and true to form he punished all bad balls all over the ground bringing up his 50 in double quick time. Glover went for 22, skying high when trying to hit over mid on, but by that point St Boswells were 135 for 2 and already well on the way to a big score. Overseas amateur Mark Williams was gradually finding his feet on the slow Scotttish wickets, whilst Broom continued his onslaught including one six that went over the houses heading for Lawries Garage and was never seen again. On 99, disaster struck when he was bowled by Gillin whilst trying for another massive blow. Aussie Williams eventually went for 25, and only Marsh with 20 was the other batsman who made a quick impact as wickets tumbled in the pursuit for fast runs as the overs ran out, the Villagers finishing on 253 for 9 from their 50 overs. With the forecast looking good, chasing 253 was always going to be a mammoth total for the visitors. 2 quick wickets for the positive Rory Elms started the rot (eventually finished with 3 for 9), Young added a couple, then Craig McNeill rolled back the years with his tempting floated off spinners, Largo’s batsmen’s eyes light up at the prospect and predictably three of them proceeded to hole out deep where the hosts and particular Scott ‘bucket hands’ Marshall snatched 3 great catches. McNeill finishing with 3 for 8 runs. Top scorer was opener Ali who reached 25 before being smartly stumped by Graham. So, St Boswells start the season with a comfortable win, with a tougher away game to come this weekend away to Musselburgh. Sunday loomed damp and overcast, and what threatened to be a baptism of fire for new “A” Team captain Steven Laidlaw vs Gala 2nd XI in the Border Sunday League didn’t quite pass off as expected. Gala went in to bat and put on 20-odd for the first wicket against the tight seaming of Scott Marshall and young Joseph Flynn. Marsh took the first 2 wickets, both caught by a newly ensconced keeper, Scott Hunter and it was not long before Elliot Ruthven, in his first spell of the season, crashed through the middle order, ending with 4 for 6 runs, and Gala in tatters. The tail-end was mopped up by Aussie, Mark Williams, getting in some valuable early season practice, with figures of 3 for 7 runs. Gala’s disappointing total of 60 should have been an easy call for St Boswells, but due to the extremely tight bowling of Pringle and Tharanga, life was not easy for the openers, nor numbers 3 and 4 who both fell for ducks. With Deans also falling cheaply, it was down to Williams to steady the ship, alongside a rock-solid, almost immobile Thomas Goodman, and finish up the game for the loss of 4 wickets. A proud moment for Steven Laidlaw, following in the footsteps of his greatly missed father, Kevin – with many more hopefully to come. 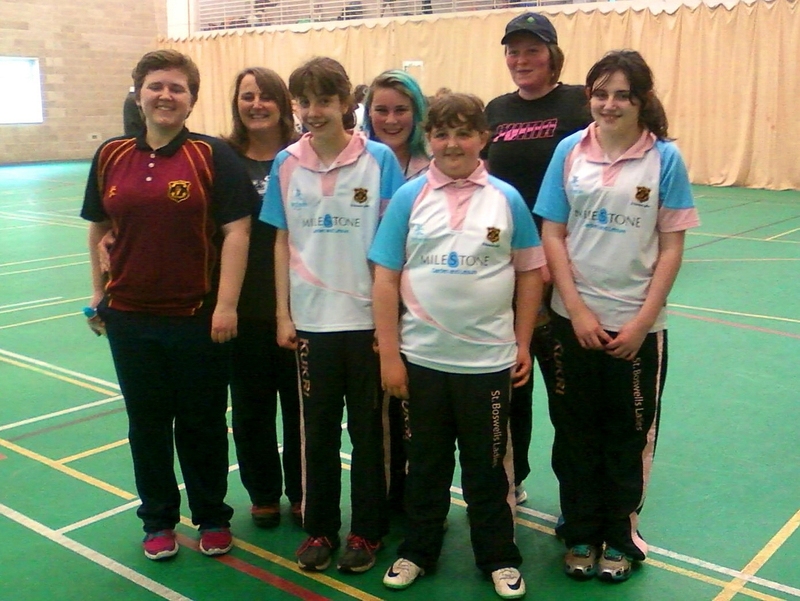 Weather was not a challenge for St Boswells Ladies’ Sixes team, competing in the fourth and final National Indoor Tournament, at MES Sports Centre in Edinburgh. Drawn in by far the hardest half of the competition, the young team captained by Rebecca Waldie, worked hard to win two of their three 5-over matches, including overhauling a strong Edinburgh University team. Jo Dixon was in impressive form, hitting sixes almost at will, but the whole team performed well in all areas, only overcome by Stirling County. Reaching the semi-final against Stirling County 2, tight bowling kept the opposition score to a manageable level, but equally tight bowling from Stirling and some superb fielding meant a six was required off the last ball. Thus challenged, young Becky Farnish obliged to see St Boswells into the final, once more against Stirling County. A massive total of 83 in 5 overs was required due to the fireworks of Scotland keeper Lorna Jack but, incredibly, this was overhauled by the partnership of Dixon and Waldie to see St Boswells made champions, and round off a perfect weekend for the club. A stunning day for cricket, belying the awful recent weather greeted players and spectators at The Green, to play their fourth match in the East League first division. The last two had been won, and St Boswells 1st XI already appeared to be the kind of team other division 1 sides didn’t fancy playing. This was to be no exception as Edinburgh Academicals stepped out to field on the sun-soaked pitch, having won the toss. Some good bowling from openers Jones and Williams made St Boswells fight for runs, and Elliot Ruthven and Chinniah Prabhakar fell fairly cheaply. Captain Broom looked initially confident but again fell cheaply. Things weren’t looking easy, but quietly Scott Ruthven was entering the thirties and once joined by keeper Ross Graham the runs positively flowed from their bats, the total passing 100 then 150 before Graham fell to a wild shot caught by bowler Williams. Young Craig Paterson fell soon afterwards, and then Ruthven to an LBW that was clearly going over the stumps, for a marvellous 97. St Boswells’ two pillars of stone, Elliot Hunter and Scott Turnbull paired up and showed how far the ball could travel with sufficient force, taking the score over the vital 200 mark. Both fell in quick succession, and pick of the Accies bowlers, Banerjee mopped up the tail end with Mann to leave a challenging 225 to win. Other games were not so successful: the much anticipated (from 2012!) Border 20/20 final vs Gala was a very tight affair, won on the penultimate ball by Gala with a boundary from Neil Crooks. Certainly a tense local derby atmosphere, proving Gala have a lot to offer – but also that St Boswells needs to improve our short-form game batting. The Murgitroyd regional semi-final was played on Sunday, as expected, against a very well-drilled Dumfries team who proved that straight, accurate bowling, and always punishing the bad ball is the key to winning games. Only Stephen Broom performed with the bat, the rest of the (albeit weakened) team falling short on what was – and has been all season – an excellent wicket. The Ladies team played their first match on Sunday 12th May against George Watsons Ladies, and it was something of a baptism of fire for the predominantly junior team. A great half century from Jo Dixon wasn’t enough to post a high enough total, but George Watsons were made to bat well and the loss will be a big learning experience for the team. The “A” Team managed to play 2 of their 3 matches, with the Langholm match (at Langholm) unfortunately conceded due to a lack of players – crossing over with the rugby 7s season will always be a problem in the Borders. A defeat to a strong Gala team, despite excellent bowling and fielding was almost inevitable, but kudos to all the players for working hard on a very wet pitch. The second match was against Manderston who are now the only Borders team who do not field an East League team (Kelso and Melrose are East League only). The rain for Manderston’s innings was persistent and the ball constantly wet, but excellent bowling and fielding restricted the opposition to 100 runs. Craig “Bubba” Paterson was the pick of the bowlers with 3 for 29. The 101 runs required were easily sought – Elliot Ruthven top scoring with 36. On to the 1st XI, who played their first match away to MDAFS – confusingly at Leith due to a sudden pitch change – and always struggled with some expensive bowling, and only Rich Young really making an impact with 4 for 41. The total of 188 should have been achievable, but again early season rustiness failed to wash off and St Boswells were bowled out cheaply for 96. Captain Broom scored the lion’s share of the runs. With a disappointing start behind them, the return of batting icon Scott Ruthven was welcomed, but it was a team effort that put St Boswells first home innings – against Edinburgh South – well out of the opposition’s reach. Opening scores of 42 (E Ruthven), 55 (S Ruthven) and 51 (C Prabhakar) showed the batting strength available. The score of 224 was too daunting, and astounding bowling figures of 2 for 7 runs in 10 overs by Scott “Tumsh” Turnbull, with support from the rest of the cast, tidied up Edinburgh South, 90 runs short. The third match, on 11th May against Watsonian 2 was a corker, but could have been so much easier. Opening the batting and almost carrying the bat through the innings, Scott Ruthven managed to chalk up a huge 134, the highest score by a St Boswells player in recent years in any type of game. It was made even more impressive because no other player scored more than 19; but perhaps on another day another player will have shone. The St Boswells bowling was uniformly tight, with honours shared across the board – Elliot Hunter with the best figures of 3 for 23 in 10, leaving Watsonians 50 runs short and out of overs. The party went on well into the night – not because we had won the league (we are edging up), but because the clubhouse is a great place to have a party! ON WINNING the toss, captain Stephen Broom decided to put Edinburgh South into bat in this top-of-the-table clash. With the wind swirling, showers in the air and a forecast that suggested it could be one of those on-and-off kind of days, Rory Elms struck first, removing Longley for six. Wilcock went LBW soon after with the score on only 25 for 2. However, Pirani and Chapman took their chances and despite giving a couple of very tough half-chances, the score moved on swiftly to 43 for 2 before rain forced the players off. Half-an-hour of waiting went by before play resumed and South immediately took the game to the Villagers, adding nearly 50 runs before spinner Craig McNeill tempted Chapman into a wild swing and bowled him for 28 just before the rain came down again. Play was suspended on 91 for 3 with 14 of the allotted 40 overs remaining. St Boswells regrouped when play restarted and with a wet ball kept things very tight and fielded brilliantly. Local legend Jamie Glover, playing his first game of the year, took two impressive catches fielding in the covers, including key wicket Pirani for 42. With Desai starting to hit out around the steady fall of wickets, Broom and McNeill cleaned up the tail to leave Edinburgh South on 148 for 9 after the 40 overs – a challenging target, especially with the outfield and pitch wet and slow. With all eyes on the Duckworth Lewis chart, St Boswells got off to a bad start as first Richard Young went, bowled for a duck, and then Ross Graham followed, chipping up to midwicket for two. With normal top order batsmen Cletus Mathurin and Elliot Ruthven missing, Broom went in at No.3 and despite limited batting opportunities this year, started to show his class, ably and assisted by Glover. With the run-rate above the D&L target, Broom was the aggressor, hitting four sixes clear over the A68, along with many fours. Glover eventually went LBW for 25 off Wilcock’s bowling. A flurry of wickets followed, but the Villagers were looking home and safe before Broom went for one big hit too many – out for an agonising 98. As the number of wickets gradually increased and the number of available overs falling steadily, it was with much relief that McNeil and Elms saw St Boswells home with two wickets and eight balls to spare. So, St Boswells stretch their lead at the top of Division 2 of the East League. With promotion beckoning we head off to play Edinburgh CC in what promises to be an edge-of-your-seat experience. In other news, St Boswells “A” thrashed Penicuik in their Border Sunday League match by 105 runs, stalwart opening bat Thomas Goodman and Alasdair McIlroy putting on an excellent second wicket partnership and Chinniah Prabhakar contributing an unbeaten 67. In the return innings Penicuik looked to be strong enough for a lively response but then fell in tatters as very occasional bowler Goodman ripped through the lower order ending with astonishing figures of 5 wickets for 6 runs. St Boswells Ladies, fielding a team with a median age of around 13 years old travelled to Stirling to play a far more experienced side. In their 20 overs they scored a creditable 120 runs, but this was not to prove sufficient for victory as Stirling wrapped up the win in double-quick time. However it was encouraging to see so much promise in such a young side. St Boswells 1st XI beat Edinburgh South by 2 wickets. 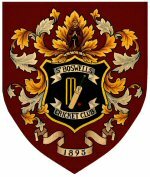 The weather finally cleared and made it possible for two, yes two, matches to take place this weekend, featuring St Boswells 1st XI and St Boswells “A”. About time too. Those of us looking forward to balmy summer afternoons basking in the solar glow with a drink in hand and the gentle sounds of leather upon willow have been sadly disabused of such notions. This is Scotland after all, not deepest Surrey. But as the Jet Stream glides northwards maybe the latter quarter of the season will prove kinder to us afficianados of the great game. Anyway, on with the match reports. field first against Boroughmuir up at Meggetland on Saturday 21st July. 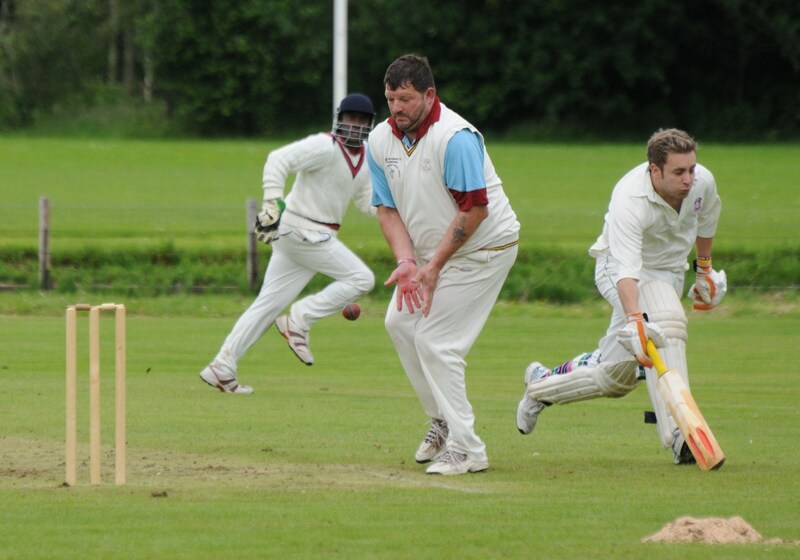 The move immediately paid off as Turnbull bowled the Borughmuir captain with the very first ball of the game. In his next over he got 2 more in two balls to put the Villagers firmly in command with the score only on 5 for 3 wickets. Boroughmuir then stuck to the task well and defiantly, but still losing regular wickets, to finish on 108 all out in 45 overs. Turnbull finishing with 4 wickets and Prabhakar with 3. After tea, the Villagers set about their work in brisk fashion. Openers Cletus Mathurin and Elliot Ruthven rarely troubled as they picked off the bowling with ease to race past 90 runs in 12 overs. Mathurin eventually went LBW shortly after getting his 50. Patterson was next in and was unlucky to hole out for a duck to midwicket. With Ruthven unbeaten at the other end, Prabakhar came in and hit the winning 4. St Boswells stay clear at the top, however in their next 2 games face Edinburgh South and Edinburgh CC who are 2nd and 3rd respectively with only 1 defeat each. A windy Sunday at Manderston saw St Boswells “A” with a team slightly weakened in regulars but certainly not weak in spirit. Manderston were to prove a tricky team to bowl against, however, and such was their resistance in the 40 overs that St Boswells stalwart Thomas Goodman was brought in to provide his own unique take on spin bowling. A fabulous spell from Elliot Ruthven (9 runs for 1 in 8 overs) limited Manderston to 154; a testing target nonetheless. With the loss of Greg Lane for 8, that man Ruthven along with Goodman stuck and stuck, almost reaching a century for the loss of just 1 wicket. With the fall of Goodman the wickets started eroding away, but not without the accumulation of valuable runs, and St Boswells eventually reached their target with a 3 from Craig “Bubba” Paterson. Only only ball remained, but the victory was ours. The next match will be a tricky home tie against Penicuik. As the skies bulged and leaked onto a slippery Philiphaugh pitch, it looked bleak for a 2012 Border Sixes Tournament taking place. Nevertheless seven teams turned up on time, the disappointing withdrawal of Langholm notwithstanding, to play a 4 + 3 set of group matches. The groups had been drawn months before and one could have been forgiven for thinking they were arranged for maximum excitement: St Boswells, Gala, Kelso and Hawick being placed together in Group 1, with Melrose, Selkirk and Biggar making up the smaller Group 2. Four overs per innings demanded big hitting, but the low bounce made running the order of the day for most batsmen except notably Kelso’s Yorkshireman McCarry, and St Boswells’ captain Broom, both of whom made mincemeat of most bowlers. As it turned out Group 1 was dominated by St Boswells, not just in batting terms but with some excellent bowling particularly from Ruthven and Elms (who also fielded exceptionally). While St Boswells mopped up Group 1, with Kelso and Hawick fighting for second position, Group 2 was a more balanced affair with Melrose coming out top after tight matches across the board. The final was a somewhat muted affair with most competitors having taken their leave, and the storm clouds threatening over the hills. St Boswells’ 59 for 1 proved too much for Melrose, especially with the loss of key batsmen early on, and the final over from Hunter was almost unplayable, leaving St Boswells with the cup and the chance to reflect on a summer which may see a little more cricket than has been possible so far. St Boswells 1st XI played Heriots 2nd XI on Saturday with the Villagers already at the top of Division 2 of the East League. This was to prove an easy victory for a match-starved team who managed to all but smother Heriots’ attempt to score runs in their innings. Pick of the bowlers was Elliot Hunter, who took 4 wickets for 18 runs in his 8 overs, with both Elms and Turnbull taking 2 wickets apiece for similarly paltry totals. Heriots ended all out for just 59 runs in 28.2 overs, well short of the allotted 40. With the rain threatening, Mathurin and Broom took it upon themselves to carry out a destructive batting display, Broom top scoring with a thunderous 42. The 60 runs was preceded by an enormous 6 towards Princes Street, and completed with nearly 29 overs to spare. St Boswells remain at the top of the division with 5 wins out of 5 and an away match to Freuchie 2nds a mouth-watering prospect for 7th July. Heriots 2 won the toss and chose to bat first.